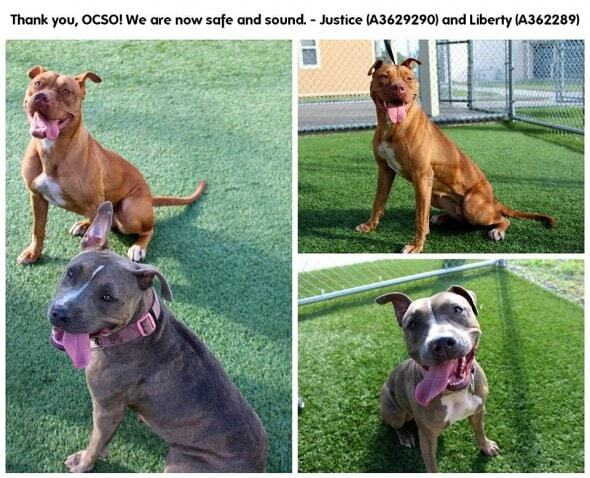 The dogs have been named Liberty and Justice, and now the Florida gals are in need of a home together. A Florida man was on his way to work very early one morning recently when he saw two pit bulls, seemingly abandoned, in the middle of an intersection that would soon be very busy. 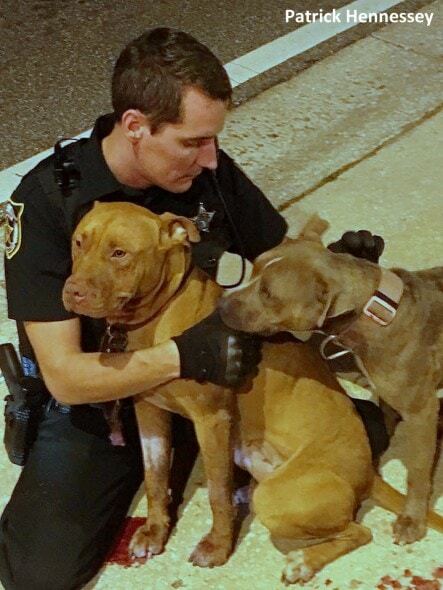 He called the Orange County Sheriff’s Office, and deputies Reed and Boggs arrived and provided lots of comfort to the pair until animal services could come to take them in. 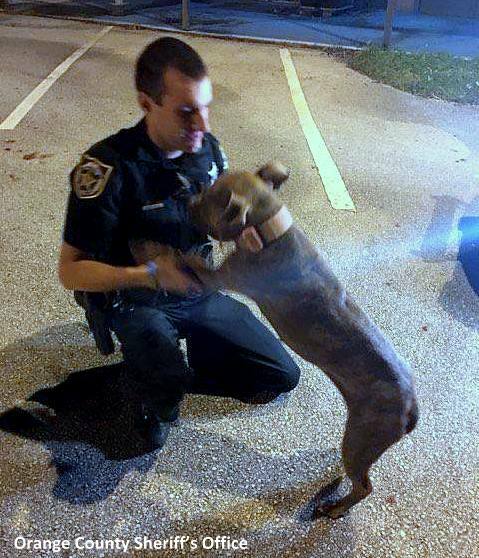 It was 4:30 am when Patrick Hennessey saw the dogs and called the sheriff’s department. 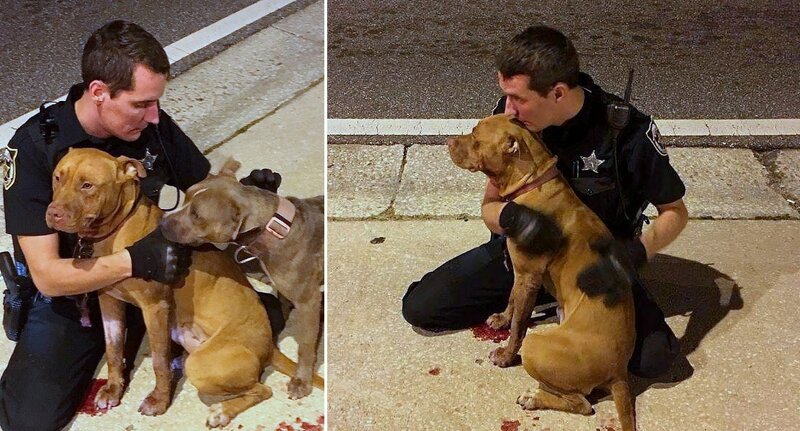 One of them had a very bloodied paw, and her companion refused to leave her side. Neither was much inclined to move at all, as they were scared and didn’t know what to do. 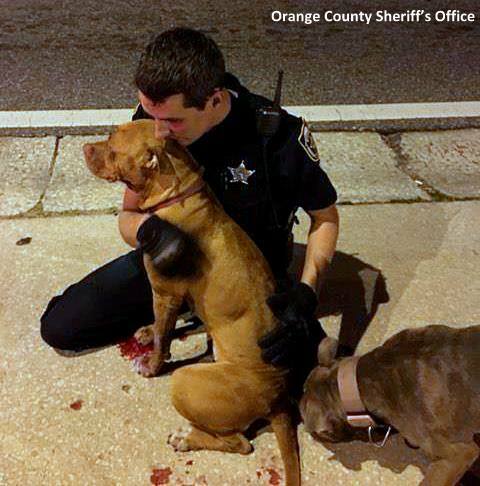 When deputies Boggs and Reed arrived, one of the men knelt down, which instantly put the dogs at ease. 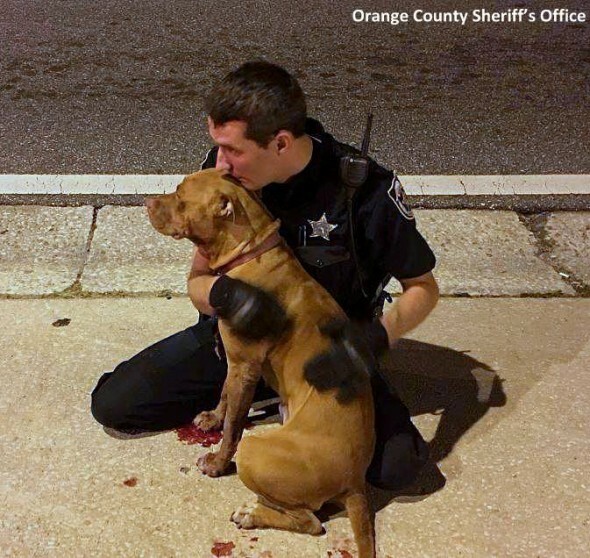 A passerby snapped a few photos of the heartwarming scene, noting that the officers even provided basic first aid and wrapped the wounded paw in gauze. The compassionate deputy stayed on the ground, petting and cuddling the dogs until Orange County Animal Services came to collect the dogs and have the injured dog get her paw examined. They named the duo Liberty and Justice. The paw injury turned out to be superficial, and the girls are in much better spirits now. They are happy to romp and play, as long as they’ve got each other. Justice and Liberty are in need of a home together. They have become a media sensation, but no one has stepped up to adopt them yet. OCAS has lots of other animals that need homes, too, so to see more of the dogs and cats they have available for adoption, check out their Facebook page. 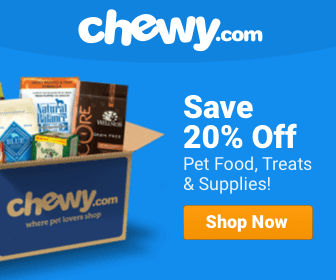 What a good thing to see that there are people who care for dogs with all of their hearts!